Three Olympic cross-country skiers from Whitehorse are named on a new sign on the city's Olympic Trail. 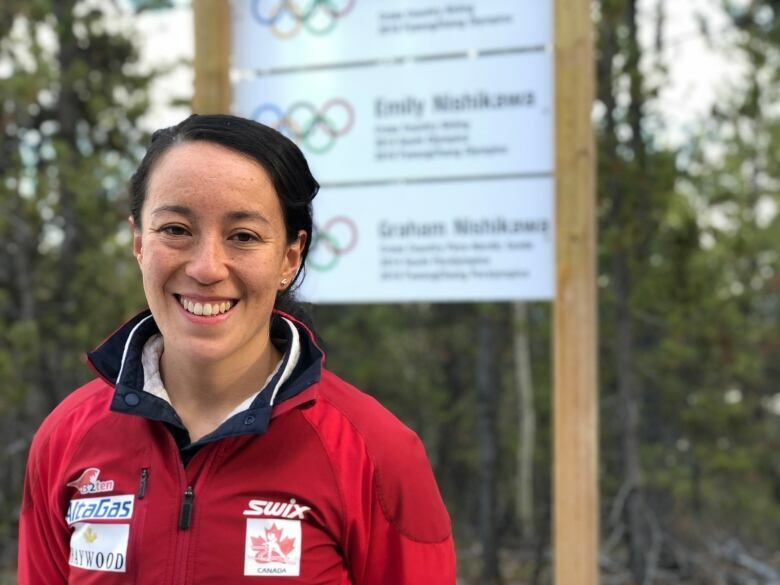 Olympian Emily Nishikawa has fond memories of learning to cross-country ski as a kid at the Whitehorse Cross Country Ski Club. "You got hot chocolate at the end," said Nishikawa. "There was just so many little things done by the most incredibly supportive community and I don't think I would have gotten to where I am without this community." This week a sign with Nishikawa's name on it was added to the club's Olympic Trail at Mount McIntyre. It stands on one of the very trails she learned to ski on. "Seeing all these Olympians' names from the Yukon on this trail when I was younger was just so inspiring — and to now get my name up here is something I've dreamed about since I was a little kid." The Olympic Trail was created in the mid-1990's to recognize Yukon athletes that have competed on the Olympic stage. "We aren't just talking about cross-country skiers, but athletes that have competed at the Olympics in any sport, including Special Olympians," said Yukoner Tom Ulyett, who attended the sign unveiling on Wednesday. Emily's is one of three names on the Olympic Trail's newest sign, which recognizes athletes that competed at the 2018 Winter Olympics in Pyeongchang. Nishikawa's name was already on the trail, marking her participation at the Sochi Games in 2014. Skier Knute Johnsgaard, who competed in Pyeongchang, had his name added to the trail for the first time this week. In 2017, Johnsgaard made Canadian cross-country skiing history when he was a member of the first men's distance relay team to ever stand on a World Cup podium. The third name added to the trail this week was Graham Nishikawa's, Emily's older brother. Like his sister, it's the second time his name has been added to a sign on the trail. "It's a huge honour, I grew up skiing on these trails as a young kid." 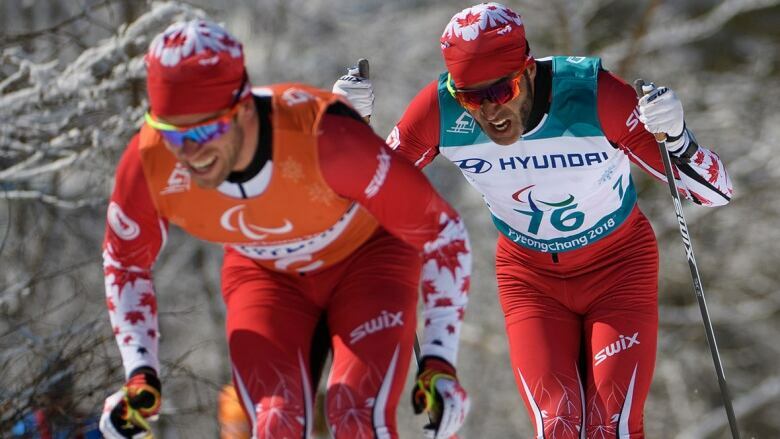 Graham has competed at the last two Paralympic Games as a para-nordic guide for Canada's most decorated Winter Paralympian, Brian McKeever. Nishikawa guided McKeever to a gold medal in thrilling fashion in 2014, leading McKeever across the line in first place, despite McKeever falling at the start. Together, McKeever and Nishikawa have earned three gold medals, one bronze, and a World Championship together. This week's sign unveiling ceremony fittingly took place on National Siblings Day. 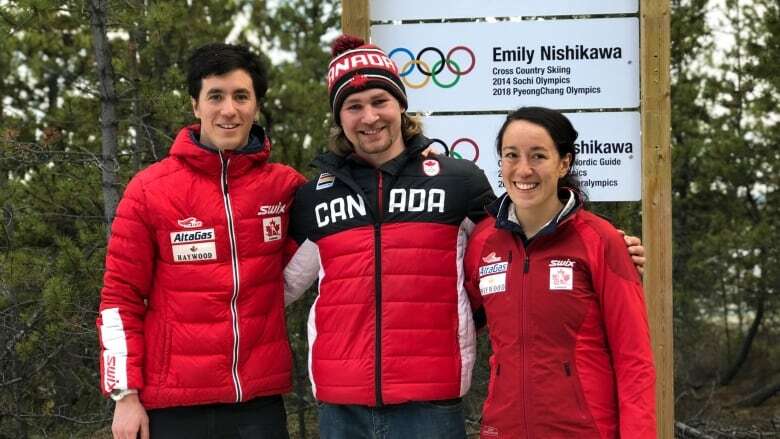 "It's really cool to see my brother's name up here beside mine, he's been such a huge help in my career and given me so much guidance over the years," said Emily Nishikawa. "We've gone through a lot together, and it's really cool to have our names together here too." George Maratos is a reporter and associate producer at CBC Yukon, with more than a decade of experience covering the north.